Atsunori Inaba hadn’t even been officially unveiled as the next Samurai Japan manager for 10 minutes when NPB commissioner Katsuhiko Kumazaki told him he carried the hopes and dreams of the public into the upcoming Tokyo Olympics in 2020 and World Baseball Classic in 2021. 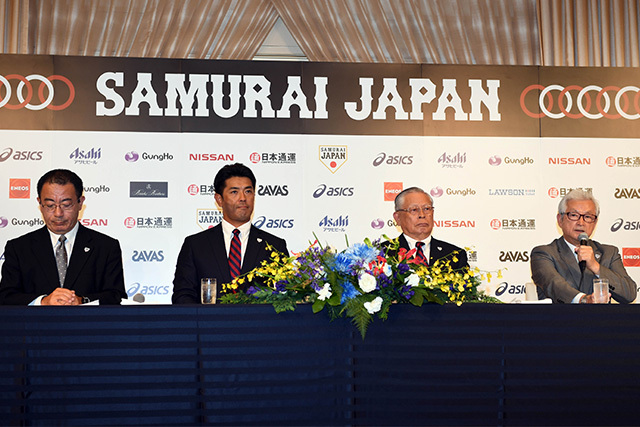 Samurai Japan Strengthening Committee director Atsushi Ihara informed him his job was to win an Olympic gold medal. Inaba, who turns 45 on Thursday, takes the reigns from Hiroki Kokubo, who stepped down in March following Japan’s run to the semifinals at the World Baseball Classic earlier this year. As was the case with Kokubo in 2013, the job will be Inaba’s first as a manager. He’ll make his debut during the three-team Asia Professional Baseball Championship in November at Tokyo Dome. Inaba still enters the role with more experience than Kokubo, who had none. Inaba was a player/coach for the Hokkaido Nippon Ham Fighters in 2013 and a hitting coach for Samurai Japan under Kokubo from the spring of 2015. Inaba also played for Japan during the 2008 Beijing Olympics and at the World Baseball Classic in 2009 (when the Japanese won the title) and 2013. One of Inaba’s biggest challenges will be meeting that goal without the services of any Japanese players who may be in the major leagues in 2020, as MLB has strongly indicated it will not release its players for the Olympics. The new manager was asked about high school sensation Kotaro Kiyomiya, the slugging Waseda Jitsugyo High School first baseman who hit 107 home runs during his prep career to tie a high school record. “He has great talent for sure, and I have interest in him,” Inaba said. “he’s hit 107 home runs. I don’t think that will be broken for a while. Inaba was a decorated player himself during a 20-year NPB career with the Yakult Swallows and the Fighters. He ended his playing days with 2,167 hits and 261 home runs and an .806 on-base plus slugging percentage. He made five Best Nine teams, won five Golden Gloves and was an All-Star eight times. Inaba was also the MVP of the 2006 Japan Series. Inaba’s first tournament in charge will come in November during the Asia Professional Baseball Championship, a three-team tournament that will feature Japan, South Korea and Taiwan. The event will be held Nov. 16-19, with Inaba and Japan facing South Korea in the opening game. As for the next edition of the WBC, the new manager is focusing on the Olympics first.